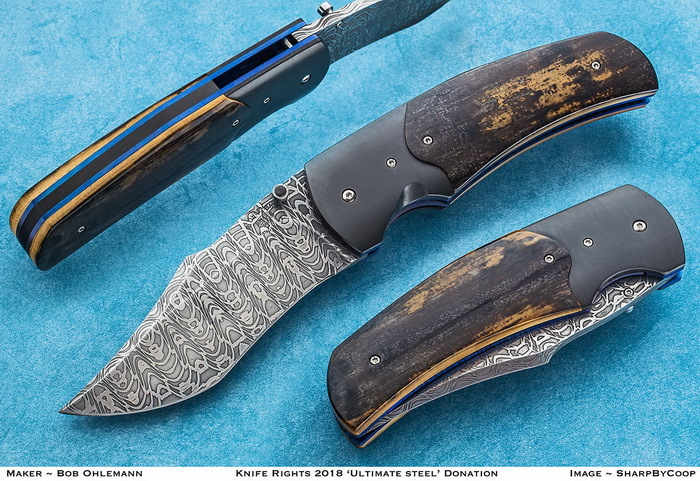 **** Chosen by Winner: Nathan S.
Bob Ohlemann has crafted a classy, but stout, Freelancer XL Linerlock Folder with a 3.5-inch Harpoon style blade of Joe Burke Spirograph Damascus. The handle features Mammoth Ivory with matte finish Zirconium bolsters. The blue anodized Titanium liners and lock are engine turned..
Each of my knives are individually designed and hand crafted using only the highest quality materials. My commitment to fine craftsmanship can be seen in every detail of each piece. First and foremost, a knife is a tool. All my knives are designed and constructed to be ruggedly used if the owner so chooses. I personally guarantee all my knives against defects in materials and workmanship for life.